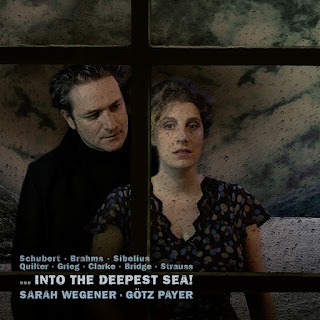 Under the title ...Into the deepest sea, this CD from soprano Sarah Wegener and pianist Gotz Payer on Avi Music explores the theme of the sea running through the songs of Brahms, Schubert, Sibelius, Grieg, Rebecca Clarke, Roger Quilter, Frank Bridge and Richard Strauss. The selection starts with Brahms, and firmly on dry land with Meine Liebe ist grün and Wenn du nur zuweilen lächelst. Whilst water flows in Da unten im Tale , it is only with the final song in the group Verzagen that we reach rushing waters of the sea. Wegener sings with a lovely vibrant tone and superbly rich sense of line and she is able to float a lovely phrase; certainly concluding the disc with Richard Strauss was clearly a good idea. But I would have liked a rather her to make more of the words; you can follow clearly with the text (provided on-line). But there is not much sense of these songs as sung poetry, Wegener really concentrates on tone and a fluid line. Wegener and Payer follow the Brahms with Schubert, a group of four songs which start in the midst of the storm of Des Mädchens Klage, moving through first loss (Erster Verlust and Du liebst mich nicht) to the strange sea-born story of Der Zerg. Both Des Mädchens Klage and Der Zerg have terrific narrative drama to them with Der Zerg having a remarkably sustained narrative. By contrast, Erster Verlust has a lovely fragility but again I wanted more sense of sung poetry. With the songs of Sibelius, sung in their original language, we reach more challenging territory. Though the sea does not come explicitly in Var det en dröm?, and we only get a hint in Säv, säv, susa, as with much of Sibelius' music there is more than a whiff of dark waters running through both of them and the second is a song of remarkable power. Wegener sings the Swedish creditably, but she does not bring that richly musical palate of colour to the words that native speakers do. We then move from Swedish to Danish and Norwegian for a pair of Grieg songs. Jeg elsker Dig and Solveig's Song are both well known but full of lyric beauty. We then make a striking move to the UK for songs by Rebecca Clarke, Roger Quilter and Frank Bridge. The explanation for this varied repertoire is that Sarah Wegener's mother is British and Sarah spent the summers of her childhood and youth in Dorset and Cornwall, and in fact, it was these holidays with their links to the sea which gave rise to the theme of this disc. Rebecca Clarke's The Seal Man setting a John Masefield poem is strange and evocative, with a remarkable ending, whilst the W.B. Yeats setting A Dream is equally remarkable and rather stark. With Roger Quilter's Now sleeps the crimson petal and Frank Bridge's Come to me in my dreams we are more in the realms of night and dreams than the sea, and clearly the theme of the disc is conceptual, and the Bridge, in particular, seemed to be a little too careful and you wanted the performers to let go a little more. The disc concludes with a group of Richard Strauss songs, but now the mentions of the sea are allusive hints. But Wegener sings the songs with a bright, vibrant line and lovely fluidity, which makes the three a fine ending to the recital. By the end of the disc, I began to wonder whether my harping on about the words might be a fault of the recording, as Wegener clearly sings the songs with a wonderfully passionate commitment. She is ably partnered by Gotz Payer. There is much to enjoy about this recital and the mix of composers makes a satisfying and intriguing compilation. Though there is an introductory article, I would have liked to have known more about why the songs were chosen and how they fit with their theme. One problem is that the website listed (http://avi-music.de/lyrics.html) does not give all the song texts, only those of the Brahms, so you have to go hunting.